During meetings with readers I found out that many of them like the Arduino project, but the greatest barrier is soldering. Some are literally scared of this – their hands are trembling. In this article I would like to make soldering more familiar. Some of electronic parts available as printed circuit boards with ready-to-use devices (modules) has already terminals in form of holes on the board. It only lacks of connectors or wires. For use with Arduino, the best idea is to solder pin header into these holes. 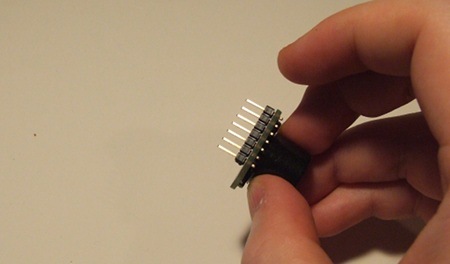 Pin header is a kind of connector with pins aranged in a line. In most cases the raster (gap between two pins) is the same – 2.54 mm (0.1 inch). Pin header fit very well to a breadboard. 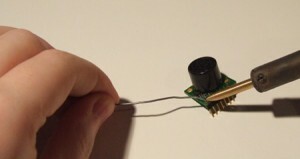 In this article we’ll be talking about soldering pin headers to Ultrasonic distance meter. If you are amateur electronic-hobbyist, you don’t have to buy advanced and expensive tools. I myself am using simple and cheap 40W soldering iron from long time ago. It’s available in electronics shops for a few dollars. Of course, I reccomend a “pencil” type, not transformer. The second type is better for wires soldering than for small elements, so excluding them, you will avoid many problems. The most important thing in using a soldering iron is to know, which end gets hot. Grabbing the unproper may end badly. The iron heats approximately for 2 minutes. It’s ready when solder melts on the soldering iron’s tip. Solder is a kind of wire made from tin and lead with specific chemicals added. Solder is usually available in a form of spool with wire in a sort of diameters. I reccomend diameter up to 1mm. 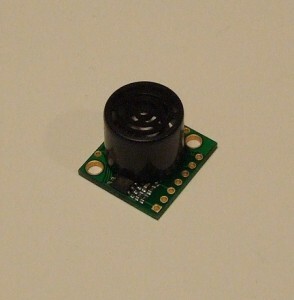 We should realize that the smaller is the diameter of solder, the smaller parts can be soldered. However, when diameter is too small, a considerable length of solder will be needed for soldering bigger parts, what could be uncomfortable. I use 1 mm solder and in the lfollowing example it will be a bit too thick. Pin headers are available in a sort of configurations (from one to a few rows). We will settle for one row. Usually they are sold in 50 pins pieces. 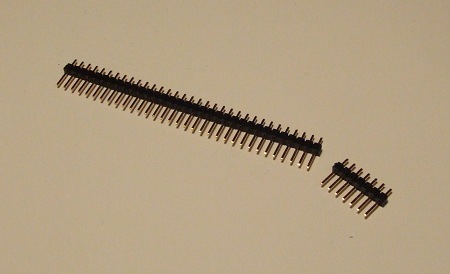 If a device requires less pins, the remaining are broken up. Holes and soldering pads should be degreased with a cloth soaked with alcohol, solvent or water. Most of the manufacturers reccomend the last option, but you must be careful, because water can easily short the circuit an slowly vapors from thin gaps like places under ICs. and trying on, whether they fit to the board. In fact, you could begin soldering right now, but yet one thing would be helpful – a “third hand”. 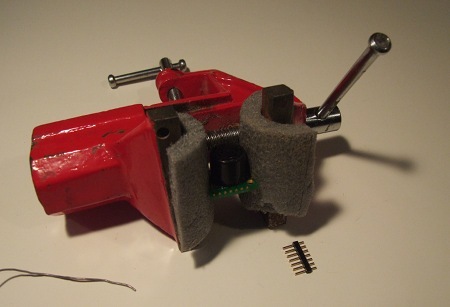 There is quite difficult to hold a part in place, when we have soldering iron in one hand and solder in the second. 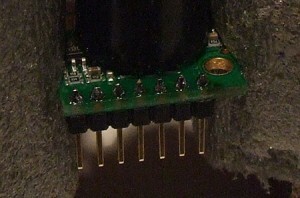 Pin headers can’t be soldered straigthly (at 90° angle) when the module leans against it. Fortunately, many ways to solve this problem exist. The most popular is magnifying glasses with “crocodile” grips tightened to a table. The board shouldn’t be tightened by the vise directly. This could corrupt it, otherwise it wouldn’t be held stabily. 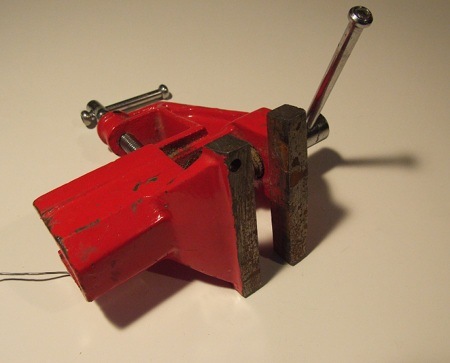 So, I suggest to cover jaws of the vise with something like foam used to isolate pipes. What to do with pin headers falling out from the board? 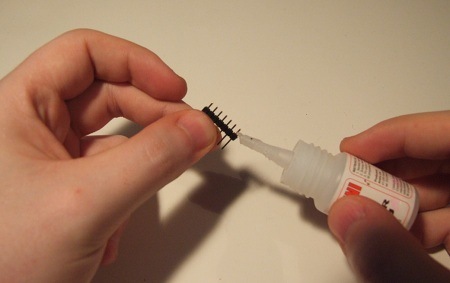 I suggest to glue the plastic ends to the board with “Super Glue”, for example. 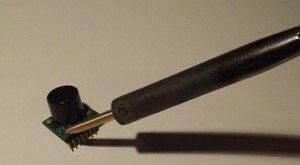 The soldering consists in putting hot soldering iron tip to the junction point. Next, solder is applied there. It must melt and flow down, filling the junction. 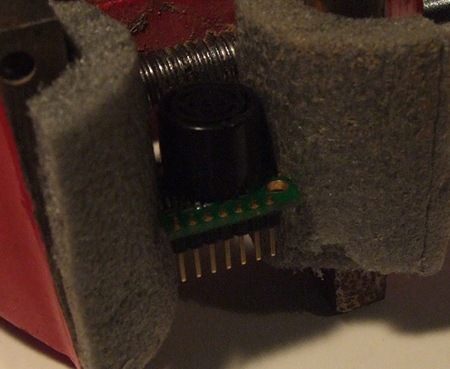 You have to remember not to heat one point too long (the soldered parts could be damaged). Manufacturers reccomend max 2-3 s.
If the solder will accidently flow over two pins, melt it and divide quickly, using something like a toothpick or match. Properly soldered junction is cone-shaped. The most common mistake in soldering is applying too less (the soldering pad isn’t well covered) or too much (there is a bead instead of a cone) solder to the junction. As you can see, dear reader, this isn’t so difficult.